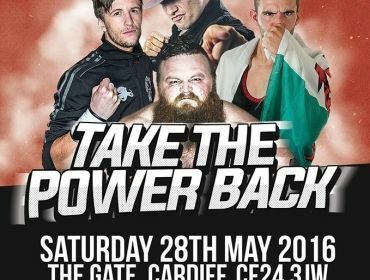 Another Vertigo Pro Wrestling review! It’s been a little while since I’ve covered this place, but they recently had a show in which they returned to The Gate Community Centre, a place I very much approve of. Mainly because I had a contemporary dance class help me out with my second year major project, so you know, a very nice place if you want to get into that, or in this case, watch some exciting wrestling action. The turnout seemed… okay. I mean, it didn’t fill the place, but enough people turned up for them to be entertained and such. They were definitely a loud lot though so it sounded like there were a lot more people than there actually were, I’ll just say that. Both men got a nice reaction, though I’d give the slight edge to Jezz in terms of fan support. Though a few people towards the left of me confused The Pastor with the son of the Holy Lord during the whole match, which definitely made him go agro a few times. He did whatever he could to spread his righteous message to everyone watching the show, even if it meant beating up Gardner as an example with heavy hits and power mixed in with his offense. Jezz would do his best to get an upper hand on Eaver with his high-risk hybrid of moves, getting nice support from people in The Gate. In the end, though, it sadly wasn’t to be as The Pastor was able to hit his The Last Supper Powerbomb into a pinning bridge to get the win, which I’ll admit is a very cool move to see in person. But yeah, that was a very nice opening match to start off the show, it’s all good. This was a match with all of the effaces looking to make a name for theirselves in Vertigo. Both Matts seemed to work well together at the start showing a small bit of tag team chemistry and they seemed to get the people behind them quite early on. Chris was acting rather weird in his demeanour throughout the match while showing bits of a powerhouse in him. He definitely has them crazy eyes. Danny was definitely the more vocal of the two, screaming at people in the crowd every chance he got. He, too, showed a bit of power in his offense that kept Horgan down for a good amount. Horgan tried to make a comeback towards the end, and just when he had the chance to take it, his partner, Boyd, simply jumped off of the apron and walked out on Horgan! Unsure why this happened, but there must be something going on between the two for that to happen. Even though Horgan tried to fight back on his own after this, Mezinger eventually hit a Spinning Flapjack like move to get the pinfall victory for his team. Now, before Walker and Mezinger had a chance to celebrate their victory, Bison Brody appeared from the back and got in the ring, scaring off the victors of the previous match with his intimidating presence. He then started to assault Horgan for… reasons, I guess? He tried to explain those reasons, but a small group of kids started chanting “We don’t care,” which oddly enough got everyone in the building chanting along with them. I’m not a kid person as I’m sure most of you are aware, but this made me smile, I’m not going to lie. When he had a chance to speak, Bison proclaimed that he is the strongest man in Wales and that no one could step up to him. So naturally, after he said this, the equally as intimidating Vertigo Pro Wrestling Heavyweight Champion, Dave Mastiff, appeared. He then said that Brody’s own mother doesn’t care about him either! OH DAAAAAAANG!! He also made a jab at Bison about eating babies, which got everyone chanting “You eat babies!” After the jokes were made, he said that if Bison wants to step up and prove he’s the best, he would accept Mastiff’s challenge for his championship later that night. So yeah, one of the biggest matches will be taking place later, nice! Before the match even began, there seemed to be a problem with Octane’s entrance as his music was playing for nearly a full minute before he even came out. People by that point were booing the fact he wouldn’t come out to the ring, but hey, maybe that was the goal, considering he seemed to have an attitude on him during the match. Storm was much more playful with his opponent throughout though, getting the people on his side right from the start. But personalities aside, this was a very fun match with lots of high paced action from both competitors. Octane used more dirty tactics to get results, but he still showed off an impressive arsenal of moves. While Jonny had a very similar offense but with a bit more showboating in his demeanour. It was also during this match that a profanity was shouted at Octane by two women, which then caught the attention of the kids near them, so they joined in as well! I’d say the cuss, but it would likely get censored as it was during my last Vertigo review, and for good reason. Parenting 101 that is! So many close calls came towards the end with Octane hitting a Sliced Bread but to no avail, and even getting a Superkick from Storm while trying to execute a mid-air manoeuvre! In the end, The Wonderkid hit some type of Fisherman Buster to get the win, which everyone seemed so happy with, myself included. But I’m more happy with this whole match anyway, definitely a nice way to head into intermission. Nothing much happened in said intermission, I just drew the ring for uni work I hope to do next year, since yes, I managed to pass into my final year! That’s going to be a challenge for sure, which is why I’m starting now to catch up on my skills for that! But anyway, back to Vertigo. This match was truly special as you had two massive heavyweights beating the heck out of each other. Both men were able to pull off amazing feats of strength on each other, with Brody executing a few scoop slams on the massive Mastiff, and even teased a suplex on him at one point. This was changed into a suplex by Mastiff to Brody though, which the people were amazed to have seen happen. What was even more impressive was to see Dave’s agility as someone his size normally wouldn’t be able to move around the ring as much as he does, but there he was, pulling off a few dropkicks that the crowd was way into. This match was simply two colossuses battling one another to see who would be the big dog in the park, but even in moments like this, you can never count out the scrappy little underdog. After a huge toss from the top rope from Dave to Bison, out of nowhere, Jonny Storm appeared and rolled up Mastiff. Unsure for a moment, the referee eventually made the count. 1? 2? 3?! 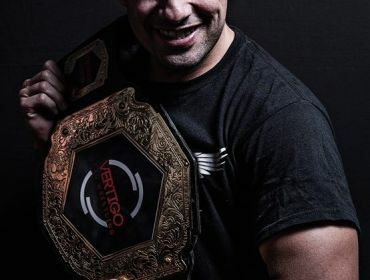 Your NEW Vertigo Pro Wrestling Heavyweight Champion? Jonny Storm?! To say that nobody in the building saw this coming was truly an understatement, I saw so many jaws on the floor from this, mine included. People didn’t know what to make of this, especially Mastiff, who seemed very cross, which you would have expected. But when everyone quieted down, Storm simply started that Mastiff said he would defend his title, “ANYTIME! ANYPLACE! ANYWHERE!”, and this would apparently full under that ruling, even if another match was taking place. Definitely a crafty way for The Wonderboy to take the championship, and in the end, Mastiff couldn’t fault him for doing this. Bison also tried to get between the two during this exchange, but he eventually had enough and stomped his way to the back. Mastiff shook the hand of the new champion in the end, and more people seemed to be all for this change in champions as Storm was celebrating in the ring as, the NEW Vertigo Pro Wrestling Heavyweight Champion. That still looks weird when I type that up, that ACTUALLY happened! The final match in the best of three series between these two, both men managed to get a victory over each other, and they wanted to end this series tonight. Ian, at the beginning offered money to Cub in hopes he would win the match. Cub seemed to oblige with Ian’s request, but just before the ten count could happen, Cub sprung back up and caught Ian off guard to get the early advantage. Another crafty move placed by someone on this show. Both men from this point on took every chance they could possibly take to get the win here. Cub slammed Ian onto the wooden stage, Ian used a steel chair on Cub on numerous occasions, so was a steel rubbish can. Ian was definitely making as much use of the weapons as he possibly could while Cub made use of his ever expansive move arsenal. Cub, at one point, dived onto Ian after an over the top rope plancha, and right on his head too! That was quite painful to see, but not as painful as the ending was. Cub wanted to hit his rotated Panda Splash on Ian, but he hid in a corner with a chair covering himself in protection. But Cub used this as an opportunity to stay on the top rope, and dive to the other corner, hitting a dropkick right into the chair that was covering Ian! With that, Ian was not able to get up in time for the 10 count, but Cub made it to his feet just in time. A very hard fought match by both men. Cub was well liked by from start to finish while Ian was booed out of the ring with him yelling “I HATE YOU ALL!” in response. Oh Evil Little Ian, you never change. This main event was quite an involved way to end the show, and by this I mean at the start of the match, the action spilt out into the crowd. In fact, it was all happening right behind me. Eddie was chopping the heck out of Bishop, who was trapped behind the wooden railing between the chairs and the floor. This wouldn’t keep Bishop down for long as he would fight back with his menacing power and aggression. Eddie would equally match Bishop with power of his own. A few moments towards the end made things equal between the two of them. Such as Bishop hitting Eddie with a suplex onto his knee, Eddie hitting a spinning side slam on Bishop, and even a huge Superplex from the top rope taking out both men. In the end though, Eddie was able to hit a crucifix powerbomb to the corner and then his Lifting Reverse DDT finisher for the pinfall victory. Eddie stood in the ring victorious with the people cheering him on to end the show. Overall, a very nice show with a title change that came out of nowhere, that was a moment that more people should have been able to see. Hopefully more people will be able to go to future Vertigo shows, and if my reviews of their shows helps sway their minds to going to one, then I guess I am doing an okay job with these write-ups after all. 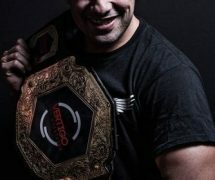 Again you can follow Vertigo Pro on their social media stuff, so until the next show of their, it’s been fun!